Stems erect, smooth, usually much branched, 1 to 4 feet high from a perennial root. 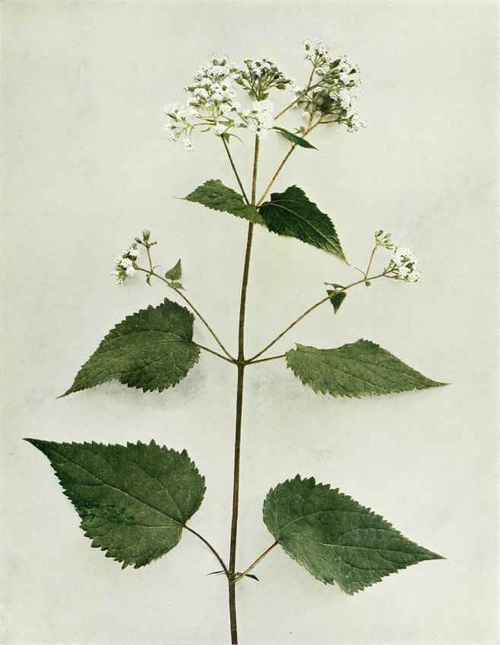 Leaves opposite, ovate, thin, coarsely and sharply toothed, 3 to 6 inches long, 1 to 3 inches wide, on slender petioles, one-half to 21/2 inches long; leaf blades rounded, truncate or cordate at the base, usually long pointed at the apex, showing some resemblance to the leaves of the Nettle (Urtica). Inflorescence a rather loose cymose-paniculate cluster of small heads, each with ten to thirty white, tubular flowers; involucres campanulate, one-sixth of an inch high, the bracts linear and arranged in two nearly equal series. In rich woods or in thickets and clearings, New Brunswick to Florida, west to Ontario, Nebraska and Louisiana. The plant is said to be poisonous to cattle.